Some of our many shops offering specials throughout the day. Check back as the list is updated! Celebrate an EASTON TRADITION—And Create Your Own Peace Candle Painting! Join us in our BYOB studio for a painting party! Ticket price includes all materials, instruction, aprons and a take-home 11×14 canvas! Sorry no promo codes accepted for this one-of-a-kind event! painting of same or lesser value for free! with musical guests the High Street House Band. 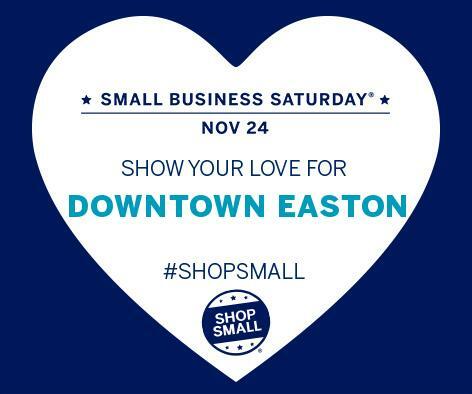 Make any donation to the Children’s Home of Easton and Genesis pays your sales tax. Special offers on bikes and accessories, plus 12 month financing available. Hot mulled cider, cookies and other treats, all day in the gallery. PLUS enter a raffle for a $250 gift certificate to the gallery. Customers will receive one entry with each purchase. The winner will be announced on Monday, Nov 25. Free stone cage with every purchase of a zodiac gift set! “Giving Thanks” a special half-hour Sphere Spotlight on the Science on a Sphere. Bellinis and Braids from 3-6 pm with stylists from J. Morgan Salon. In addition, spiced cranberry Bellini’s are the drink special of choice. Watch the Peace Candle documentary and learn about the history of this symbol of hope and community. Documentary will screen on a loop throughout the day. 11:00am-2:00pm – Kids’ Craft: Make Peace Candle luminaria and take them along to the ceremony later in the day (free craft activity). Celebrate Small Business Saturday with 10% off local history books in the Museum Store. Watch for NCHGS volunteers in period dress in and around Centre Square before the lighting ceremony! Free $10 gift certificate for every $50 purchase and a free $20 gift certificate for over $100 purchase. Plus so much more! Please visit our Retail Concierge tent in Centre Square for directions to our fabulous businesses. We are proud to support the Small Business Saturday movement that has taken hold over the last five years. As a consumer, you are a key part in helping small businesses thrive. By shopping or dining at small businesses throughout the year, you’re showing your support for the small businesses in your neighborhood in the community you call home. For every $100 spent at locally owned businesses, $68 stays in the community, compared to $43 spent at chain or big box stores.